The day after this country elected Barack Obama its 44th president, a doctor told me I'd inherited from my father a rare form of cystic kidney disease and that I was already in renal failure. Beyond the devastation I felt on hearing this news, and despite having health insurance, my greatest fear in those first, foggy days was one that haunts millions of Americans. I was more terrified of being dropped or denied treatment by my insurer over some minuscule technicality than I was of facing the disease. After four years of progressive activism, delivery of Obama's campaign promise of universal healthcare suddenly became very personal and urgent rather than simply a political goal for me. A few weeks into my ordeal, however, I learned that my diagnosis qualified me for a little-known existing "public option," or government health insurance plan. The same program had saved my father's life, but I was frankly surprised to learn it still existed despite numerous legislative changes through the decades. Today, almost a year after my diagnosis and amid the disheartening acrimony and willful misinformation pervading our healthcare debate, I can bear witness to what constitutes "socialized medicine" in the United States. My family's 36-year journey with end-stage renal disease -- the only long-term, chronic disease classification for which the U.S. government provides insurance coverage, regardless of age or income -- offers a telling case study into what once met Congress' standard of an unequivocal, moral imperative to provide public-financed health insurance. My family history mirrors exactly the period from 1973 to 2009, during which this entitlement program has allowed access to life-saving dialysis and kidney transplants, treatments previously denied to all but a very privileged few. The story of the Medicare End-Stage Renal Disease (ESRD) Program is illustrative of a government plan compelling private insurers to cover more Americans than they ever did when induced solely by market forces or their own good intentions. In today's political parlance, as the president put it in his Sept. 9 address to a joint session of Congress, this translates to a public option that will "keep [private] insurance companies honest." This history also presents a cautionary tale of how profit-driven forces chipped away at Medicare ESRD's effectiveness, resulting in higher treatment costs and worse patient outcomes (compared with those of other industrial nations) for the 506,000 ESRD patients in the U.S. today. It was the summer of 1972 when my 30-year-old father, Wayne Nix, learned his kidneys were failing. As a high school teacher, with a wife and two little girls to support, his only two choices were death or financial ruin. Doctors at the University of Michigan Medical Center estimated he had six months to live without beginning hemodialysis -- a process by which plastic blood lines are connected to the body via needles (usually in the arm) and blood is mechanically pumped out of the body and circulated through an artificial kidney for three to four hours at a time, usually three days a week. 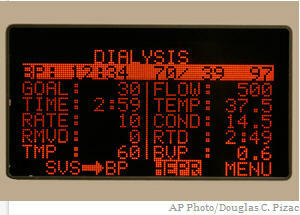 Back then, dialysis costs ran between $10,000 and $15,000 a year. On short-term disability leave from work, with no savings to speak of and a brand new mortgage on a $27,000 house, my father found himself in possession of an employer-provided medical insurance policy with a high deductible and a low lifetime cap on payments for healthcare and prescription drugs. With hospital stays, doctor visits, medicines and dialysis costs, my parents quickly approached the dizzying precipice of bankruptcy. To help stem our financial hemorrhaging during those initial months, my parents' friends held parties at which there would often be the benevolent and anonymous device known in 1970s Midwest vernacular as the "money tree": a small tree branch set in a makeshift pot with $10 and $20 bills fastened with twist-ties, like so many leaves. Even as my father hoped for a transplant, though, he knew there would be no money to pay for it. By the 1960s, dialysis and transplantation were established as effective treatments for kidney failure, which could allow ESRD patients to live full and productive lives. With no funding for long-term, chronic dialysis, however, hospital committees decided who would live and die. These committees looked at age, complicating health concerns, psychological well-being and a patient's "social worth," but because the wealthy could afford to pay for their treatments outright, they were the most often treated, resulting in a class-driven mortality rate. The government "death panels" decried in the hyperbolic rhetoric of today's right-wing anti-healthcare reform fanatics may be imaginary, but in the 1960s and early '70s there really were death panels for ESRD patients. It was the federal government that put an end to this practice. "At that time, simply put, there were no private insurers willing to cover ESRD patients," according to Richard Rettig, an adjunct social scientist with the Rand Corporation and a leading authority on the history of the Medicare ESRD Program. "I have a letter from [dialysis pioneer and physician] Belding Scribner to Met Life, imploring that company to initiate coverage for life-saving medical treatments for chronic kidney failure patients. Scribner and others went to all the big insurers at the time, and not one answered the call to cover chronic ESRD treatments. "We had established treatments for chronic kidney failure available, but they were beyond the means of Joe Citizen, and our society had a very real dilemma concerning how to balance proven care against scarce resources," Rettig told me by phone. But even if he didn't know it back in that summer of '72, my father had reason to be hopeful. By then, after years of activism carried out by advocacy groups, pioneering dialysis and transplant physicians, a growing community of nephrologists, patients, elected officials and congressional staffers, the stars were aligning for the inclusion of ESRD in the Medicare insurance program. The passage of Medicare and Medicaid in 1965 had opened a legislative door, and in the fall of 1971, Congress held hearings on the idea of national health insurance for all. Advocates for ESRD's inclusion in any proposed legislation were well represented, particularly by dramatic testimony from Shep Glazer, then the vice president of the National Association of Patients on Hemodialysis (today the American Association of Kidney Patients), who shared his story while dialyzing right there on the chamber floor. "I am 43 years old, married for 20 years, with two children ages 14 and 10. I was a salesman until a couple of months ago, when it became necessary for me to supplement my income to pay for the dialysis supplies. I tried to sell a noncompetitive line, was found out, and was fired," he said. As his blood pumped through the artificial kidney for all to see, Glazer asked the House members: "Gentlemen, what should I do? End it all and die? Sell my house for which I worked so hard, and go on welfare? Should I go into the hospital under my hospitalization policy? Then I cannot work. Please tell me. If your kidneys failed tomorrow, wouldn't you want the opportunity to live? Wouldn't you want to see your children grow up?" It is impossible to determine the deciding factor, but eventually Democrats and Republicans in both the House and Senate agreed nearly unanimously that the plight of ESRD patients constituted a moral imperative to provide access to healthcare through government insurance. A Democratic Congress passed the Medicare ESRD Act in October 1972, for the first time singling out a specific disease for Medicare coverage without requiring beneficiaries to be age 65 or older. (Lou Gehrig's disease is also covered similarly under Social Security, but patients generally live only two years past diagnosis.) A Republican president, Richard M. Nixon, signed the act into law, and by July 1973, the entitlement was paying for my father's dialysis, along with that of about 7,000 other kidney patients. Medicare ESRD would pay for my father's home-based dialysis for 17 years. It also paid for an unsuccessful transplant attempt in 1975 and a successful cadaveric transplant in 1991, as well as hospital stays and some of his prescription immuno-suppressant drugs, which kept his body from rejecting the new kidney. Without passage of this landmark legislation, those doctors who first told my dad he had six months to live would have been right. Instead, he lived another 27 years -- teaching, coaching and creating a National Kidney Foundation program for the vocational rehabilitation of kidney "consumers" (he hated being called a patient). Wayne Nix became a nationally known activist and even testified before Congress about the need for better regulation of dialysis centers. He also happened to outlive a couple of those doctors. Some call it the "silent disease," because there are few symptoms until the very end, when your kidneys give up on you. Even though I'd been steeped in my father's illness and activism, kidney disease sneaked up on me, too. Having been told that my dad's was not a hereditary form of kidney disease, I'd operated under the assumption that it would not be passed on to me or my younger sister. My father died in 1999, so he wasn't around to talk to, or to pick up on little signs he might have noticed. It didn't help that no physician or psychologist I'd sought out ever suggested there might be actual physiological reasons for my fatigue and depression. I was just another woman around 40 complaining about having no energy or interest. In fact, in October last year, instead of giving me the blood tests that would have confirmed the irreversible damage to my kidneys, one 50-something male doctor even looked down at me over his bifocals and said, "Stop thinking you're so fragile. Try yoga." Two weeks later, I learned I'd been in renal failure for months and that my type-2 medullary cysts had been forming over a period of probably 10 years. I am one of the lucky few ESRD patients, covered by both private insurance and Medicare, who go from diagnosis to transplant within six months. There are more than 80,000 people waiting for kidneys in this country. Last year, according to the United Network for Organ Sharing, only 16,517 got transplants: 10,550 with the cadaver organs allocated through the national waiting list, and 5,967 from living donors. More than 4,000 people on the waiting list died -- that's about 13 a day. The list has been growing by about 3,500 names a year, and the wait varies from state to state; in California, where I live, the average is seven years. Because a friend graciously and miraculously stepped up to give me another chance at a full life, I didn't have to rely on the list. We had the surgeries on May 22, at the University of California, San Francisco. I can only say that I simply have no words to express the depth of my gratitude to my living donor. Fortunately, I'm also able to focus on getting back to life, and not on how to pay a mountain of medical bills. Most of my bills -- for both the donor's and my own surgeries -- arrive saying they're already paid in full, between the private insurance we have through my husband's job, and Medicare ESRD. Today's Medicare ESRD Program is somewhat different than in its early days. Among the many legislative changes to the program, those that most affect me are the Medicare Secondary Payer (MSP) provisions enacted by Congress in the 1980s. These laws stipulate that as a transplant recipient, I qualify for three years of Medicare ESRD coverage, but because I also have private insurance, my private insurer is mandated to be the primary payer for the first 30 months after my transplant, and Medicare is primary for six months (it's an 80 percent primary, 20 percent secondary split). Should my body reject my transplanted kidney at some point, and I find myself in need of dialysis, my private insurer would be the primary payer for another initial 36 months, and Medicare ESRD would then pick up primary costs for as long as I stayed on dialysis -- be it days, months or years. When I brought up the fact that my transplant and immuno-suppressant drugs are primarily being paid for at this point by Aetna, not Medicare ESRD, Richard Rettig (the Rand social scientist) clarified my statement for me. "Yes, Jennifer, but let me assure you. Aetna would not be covering your care at all if not for the passage of the Medicare ESRD Act in 1972, and the MSP provisions in the '80s and early '90s. Full stop." Without the government stepping in to remedy a situation that the market and private business willfully ignored, both my father and I would most likely have died within a year of our diagnoses. I believe every American citizen deserves the same kind of health security. Even before I got sick, my father's story was the reason I became an activist myself during the Bush years, as I saw people's faith in government dwindling. It's why I fought so hard to get Obama elected, and why I'll be gravely disappointed if he gives in on the public option. But, truthfully, all of this costs a lot of money. Legislative changes to Medicare ESRD over the years, in particular the shared-payment provisions, have attempted to rein in taxpayer-funded costs as the program took in greater numbers of beneficiaries. These mandated the shifting of some costs to private insurers, though they still only cover about 10 percent of the total ESRD population, while Medicare covers 75 percent. Medicaid and Veterans Affairs cover the bulk of the remaining 15 percent of ESRD patients in the United States. "This program has provided vital insurance coverage to more than a million Americans, and patients eligible for Medicare ESRD are very happy with their coverage," says Bobbi Wager, board president of the American Association of Kidney Patients (AAKP). Wager, who's undergone dialysis and two kidney transplants, also told me, "Kidney patients are very fortunate to have this safety net, but this program is not cheap, so we have to constantly be looking for ways to control costs, or risk losing it." Opponents of "government-run healthcare" in general, and now President Obama's public option in particular, point to the fact that Medicare ESRD's costs have far exceeded initial projections and extrapolate from this the wrongheaded notion that the program's problem is simply that government is inefficient or inept. So, let's dive into the numbers. According to AAKP, 1972 estimates had program costs at $250 million, while today approximately $23 billion is spent on Medicare ESRD, out of a total Medicare budget of $355 billion (for some perspective, the GAO reported that U.S. defense spending in 2008 was around $800 billion). The U.S. Renal Data System's (USRDS) 2008 annual report shows Medicare ESRD consumes 6.4 percent of Medicare's budget to cover 1.2 percent of its total population. While we're deep in these weeds, I'll also report that Medicare's average cost per ESRD patient per year is $61,164. Breaking that down, Medicare spends an average of $71,889 per year on a hemodialysis patient and $24,952 per year on a transplant patient. Critics, like John Graham at the National Review in his spectacularly ill-informed post, fail to acknowledge several major points, however. First, what these numbers don't show is that, even with the major increase in total costs over original projections, compared with other areas of Medicare, the ESRD Program has restrained its per capita costs, and the reimbursement amount for dialysis, roughly $160 per treatment, has not gone up since the mid-1980s. Second, contrary to the notion that private companies can more efficiently and cheaply insure healthcare, consider these facts: Total public and private spending on the ESRD population, according to the USRDS 2008 report, was $34 billion. So, if we revisit the percentages above, Medicare covers 75 percent of the ESRD population for $23 billion, while $11 billion is spent to cover the remaining 25 percent of ESRD patients, including the 10 percent covered by private insurance. In other words, private insurance pays $4.4 billion to cover 10 percent of ESRD patients, which suggests that it would cost private insurance $33 billion to cover 75 percent of the ESRD population -- $10 billion more than Medicare now pays. So, who's more cost-effective? The major contributing factor to Medicare ESRD's overall cost explosion is the larger-than-anticipated number of beneficiaries, due to diabetes and heart disease patients being successfully treated in far greater numbers, resulting in correlating numbers of patients reaching end-stage renal disease and qualifying for the program. Early on, most diabetics and hypertension patients died before that point. In the 1990s, incidence of diabetes-caused ESRD rose almost 200 percent. Today, diabetes is the cause of 43 percent of ESRD, while hypertension accounts for 23 percent. By contrast, all the genetic cystic diseases, such as mine, account for less than 3 percent of ESRD cases. Another part of the cost equation is that in other industrialized countries, which provide universal healthcare for their citizens, more people are diagnosed early and benefit from cheaper, preventive care. In the U.S. with our tens of millions of uninsured and underinsured, people avoid doctors and get diagnosed later in the progression of disease, when treatment is more expensive. Medicare ESRD has grown by 2 to 4 percent each year since 1973, but with an estimated 26 million people now walking around with some level of chronic kidney disease, combined with the diabetes and obesity epidemics in America, the number of patients qualifying for Medicare ESRD is projected to double by 2020. About 60 percent of these people could slow or prevent the progression to kidney failure through diet, exercise and preventive disease management. Want some advice? Get your kidneys checked. Medicare ESRD's real problem, for critics and advocates alike, is the higher mortality rate for U.S. dialysis patients, compared with that of other industrialized countries. But again, the critics' refrain that this is proof of a "bloated and inefficient government program" is not accurate. The exact opposite is true. It's the private portions of the plan that cause problems. That ESRD patients' first-year dialysis mortality rate is 21 percent, while Japan's is 9 percent and Europe's rates hover around 15 percent, can be traced primarily to profit-driven forces. Though U.S. dialysis began in Seattle with Dr. Belding Scribner's vision of nonprofit, community-based dialysis, with a major push toward having patients dialyze at home, where overhead is cheaper and outcomes have long proven superior, the Medicare ESRD entitlement instead spawned a disease-profiteering industry and the proliferation of corporate, for-profit dialysis centers. DaVita and Fresenius Medical Care, the two largest chains, now control about 60 percent of the nearly 5,000 dialysis centers in the U.S., and in-center dialysis overall accounted for 92 percent of dialysis in 2008. While Medicare's reimbursement rate is regulated by Congress, there is no regulation of what dialysis centers can charge private insurance, so rates can be much higher and vary greatly. "Profit-driven dialysis is a problem," says Bill Peckham, a 19-year dialysis patient and a trustee of Seattle's nonprofit Northwest Kidney Centers, founded by Scribner. "With Medicare reimbursement not going up, the centers need to squeeze profits out of patient care, essentially through shorter hours of operation, using techs instead of nurses, shorter dialysis treatments so they can flip the chairs, and reusing artificial kidneys. They don't push patients to get optimal treatment, because it comes out of their profits. And patients feel sick all the time because they're not getting enough dialysis." "The mortality rates in Australia and New Zealand are among the very lowest, around 14 percent, and they have much higher percentages of patients on home dialysis," adds Dr. Christopher Blagg, professor emeritus at the University of Washington, and a former CEO of Northwest Kidney Centers. "Why the difference? They say it's because their publicly funded universal healthcare program focuses on early diagnosis and prevention, and that their doctors are on salary, not fee-for-service. Dialysis care is also run out of major hospital centers, their government's reimbursement rate for home dialysis is bigger -- and they have no for-profit dialysis." In 2007, the Journal of the American Medical Association published a report that for-profit dialysis centers had also been overprescribing an expensive anemia drug. In an effort to boost certain blood levels to suggested levels, which is done elsewhere through optimal dialysis runs, the for-profit centers reportedly ran patients for shorter periods, but gave them higher, sometimes dangerous levels of the anemia drug. This move allowed them to squeeze more profits out of Medicare ESRD due to shorter dialysis times and the separate billing of drugs not included in the regulated dialysis reimbursement rate. This profit-driven use of drugs cost Medicare ESRD $1.8 billion in 2004 and is the largest single drug expenditure for Medicare overall. Forbes reported in April that DaVita CEO Kent Thiry's average compensation over the past six years was $22 million, and the company reported $6 billion in revenues, according to Fortune, which ranks DaVita as 433rd on its Fortune 500 list. Their profits, Peckham believes, can be directly linked to poor patient outcomes. This is by no means the only factor, but everyone I interviewed -- even the employee of a for-profit dialysis center who asked not to be identified -- agreed that the drive for profits has contributed to Medicare ESRD's higher dialysis mortality rate; the differences among them were only in degree. As I watch the cable news loops of all the vicious language and wild-eyed imagery aimed at killing healthcare reform, I can't help but be amazed that Medicare ESRD was ever passed. I wonder how so many Americans today can be made to believe that healthcare is "anti-Constitutional" or that a fascist/socialist (and, let's not forget, African) Obama wants to kill their grannies, but I am awestruck by the headstrong self-destruction of the Republican Party. There is no clearer proof of GOP decay than comparing the Republican leadership of the 1970s with those controlling the party today. Republicans in the 1970s were on the side of healthcare for all Americans. In a message to Congress on Feb. 18, 1971, Nixon himself proposed the National Health Insurance Partnership Act. This was a moment in our history when most Americans believed some form of all-inclusive, national health insurance would soon be a reality. Republicans and Democrats alike were working hard to find the best way to make it happen. In 1972, a generation of pragmatic and compassionate Republicans voted in large numbers to help pass the Medicare ESRD Act. It was seen by legislators as a test case, to be followed by government insurance programs -- be they catastrophic or comprehensive -- for other diagnoses. This never happened, of course, and right up until our summer of angry town halls, Medicare ESRD has remained what former Senate Finance Committee staffer James Mongan called "the last train out of the station for national health insurance." Today's Republican leadership follows the lead of hate-speech blowhards and injects vitriol and proven lies into our national discourse, instead of engaging in honest negotiations over the best way to bring healthcare to all Americans. They are ginned up for an Obama defeat, by any means necessary -- good policy and the American people be damned. If we don't get healthcare reform this time around, I have to wonder what will become of the programs caught in the middle, like Medicare ESRD. It's unknown at this point whether I'll need another transplant or long-term dialysis at some point, but it's highly likely. The bottom line is treatments for ESRD are expensive and ongoing. With this diagnosis, it's either dialysis or, if transplanted, expensive immuno-suppressant drugs for the rest of one's life. But because I have this benefit, when my fellow citizens with, say, cancer do not, it's hard not to feel some guilt. This nation must face difficult questions. Will this society continue to be willing to bear the costs of an entitlement program for ESRD patients, as the market has proved that it will not if left to its own devices? Should we simply let ESRD patients die? Or do we believe that as a society, certain of us will develop catastrophic illnesses and that we all deserve health security? Is this "charity," as a conservative friend of mine suggests, or a society sharing the risk that any one of us could face illness and financial ruin tomorrow? Should the "right to life, liberty and the pursuit of happiness" be interpreted literally? If so, shouldn't guaranteed healthcare be the right of every U.S. citizen? If the answer to that question is yes, shouldn't all of us -- Democrats, Republicans and Independents -- be working together to find the most effective and cost-efficient system for its delivery? It remains to be seen whether Congress will pass healthcare reform this year. Like many before it, this effort may not succeed, and we'll remain, as Obama has said, "the only advanced democracy on earth -- the only wealthy nation -- that allows such hardships for millions of its people." For now, I'm just grateful there was a time when Congress felt the moral imperative to provide a public health insurance option that allowed both my father and me to live.